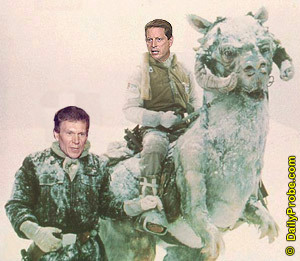 HOTH (DPI) - Menaced by the growing power of the GOP and smarting from last Tuesday's defeat, Democratic forces have regrouped at a secret base on the remote ice planet Hoth. In response, GOP leadership has ordered probe droids to blanket the galaxy to flush them out and, in the words of Cmdr. Darth Lott, "put an end to this pitiful party once and for all." Led by Al Gore-Kenobi and Tom Daschlewalker, Democratic leaders vow to be strong enough to "pull the ears off a Gundark" by next election. Former Vice Presidential candidate Joe Lieberman was last seen headed for the Dagobah system. WASHINGTON (DPI) - Fresh on the heels of becoming the number-one movie at the box office last week, the makers of Jackass: The Movie are under fire yet again after President Bush injured himself while imitating a stunt he had seen in the film. At a dinner with Naoto Amaki, the Japanese ambassador to the U.N., the president snorted approximately three tablespoons of wasabi in an effort to gain his support for the United States' coming war against Iraq. "The president was not seriously injured, but he'll be recuperating for at least the next two days," said White House Press Secretary Ari Fleischer. "Sadly, though, Japan now falls under the president's Axis of Evil." SIOUX CITY, Iowa (DPI) - As he dressed for work this morning, James Carver pinned a green and white ribbon onto his lapel. "I'll be damned if I can remember what flavor-of-the-week cause this one is for," he said. "Last month, HR had all of us wearing an orange and green ribbon for something. I think it was to support survivors of pancreatic inflammations. And before that, we had one for homeless Alzheimer's patients, or some crap like that. I don't even know." While Carver acknowledged that supporting people in need is important, he emphasized that it was even more important to "not forget to wear the stupid ribbons." KANSAS CITY, Mo. (DPI) - Ever since she was a little girl, April Mecham has believed that the boogeyman was living under her bed. Yesterday, 32-year-old Lyle Donner was hauled out from beneath her bed and arrested after he absentmindedly handed a dropped phone back to her. Police estimate that he has spent much of the last 10 years under Mecham's bed. "To be honest, I'm surprised she didn't catch me earlier," Donner told authorities. "You'd think she'd hear my TV or smell me making French toast under there. Hell, more than once, I'd pop up and grab her bong after she'd had a few hits. If she hadn't been high most of the last decade, she'd certainly have questioned all the pizza deliveries." New York (DPI) - Internet provider America Online today revised prior earnings reports and admitted that revenues for all previous fiscal quarters totaled $0. "Although we didn't make any money and lied about it, we still claim to have shipped over 132 billion free CDs all around the world -- and that's billion with a B, people," said an AOL spokesman. AOL shares were up sharply on expectations that more free CDs may arrive soon. Daily Probe Sued For Stereotyping Monkeys as "Poo Flingers"